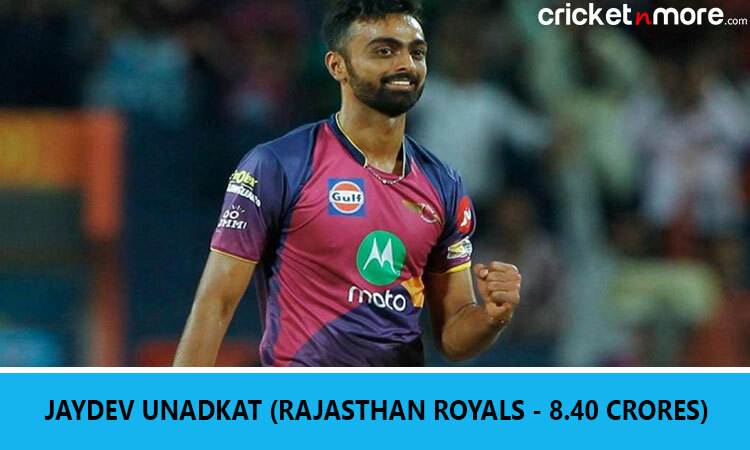 Jaipur, Dec 18 (CRICKETNMORE): Inaugural Indian Premier League (IPL) champions Rajasthan Royals has splurged a whopping Rs 8.40 crore to buy back India discard left-arm pacer Jaydev Unadkat in the Indian Premier League (IPL) auction here on Tuesday. The Royals were locked in an intense battle with Delhi Capitals and later on with Chennai Super Kings before getting back the services of the paceman, whom they released for the auction. Unadkat grabbed the eye-balls last season when he became the highest paid Indian after being bought by the same franchise for a whopping Rs 11.5 crore. Meanwhile, besides Yuvraj, the other stars who went unsold are Test specialist Cheteshwar Pujara, New Zealanders Martin Guptill and Brendon McCullum, Englishmen Chris Woakes, Alex Hales and Chris Jordan.